Will sadly have to wait until 2015. But it's been decided - I'm heading to New Zealand and Australia. Probably as expensive as my last three trips put together (best case scenario I'm looking at about $2500 in airfare just to get there and back... which is a bit higher than the $700 return it cost to get me to Turkey and back)... but it'll be worth it. I'm thinking either Spring or Fall - I'm not one for the heat of the summer, and find that travelling in a bit of an off-season means less tourists (and yes, I know I'm one as well, but I try and assimilate the best I can with the locals and try not to draw attention to myself) and cheaper rates. The plan is for at least four weeks... similar to my recent trip to Eastern Europe. Maybe more. Starting next week I get four weeks of holiday time each year, and that means I can carry over that amount of time as well from the previous year, so by 2015 (considering I can't spend any money on travel between now and then so I can save, save, save!) I'll have tonnes of time! My plan right now is to fly Air New Zealand, because they allow a "free" stopover on the way to Melbourne in Auckland. Visit New Zealand for a week or so to see the north island (I know, it's not enough, but I'm not independently wealthy, so I can only do so much!) (and maybe run into the hot lawyer I met on my travels in Bulgaria), and then over to Sydney, go up the coast to Brisbane and then, if AirNZ is having the same deal that they are now in two years, fly back home via a "free" stopover on the Cook Islands. 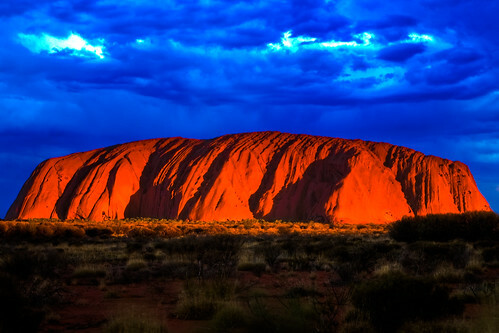 And, yes I will be visiting Uluru, even if I have to hitch hike to the middle of Australia! And it better look like this when I'm there!! i cannot wait to read about this trip! it has always been my dream to visit australia while I am young enough to enjoy all it has to offer!! Good for you! !